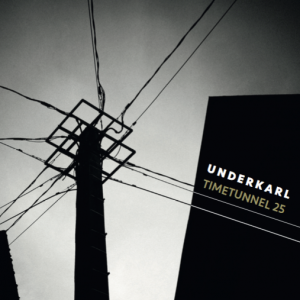 Cologne based quintet UNDERKARL celebrates their 25th anniversary with the release of their new album ‘TIMETUNNEL 25’. Founded in 1992 by Sebastian Gramss, this band is a true rarity within the fast changing jazz scene. They have recorded 8 albums together. The last album ‘Homo Ludens’ received the ECHO JAZZ award in 2013. From the very beginnings in 1992, Underkarl gained a reputation of a major game changer in jazz. With their unmatched innovative approach in dealing with jazz tradition, the quintet influenced a wide audience and inspired countless musicians. With more than 400 concerts – including important festivals in Germany and abroad – as well as several worldwide tours for the Goethe-Institut, Underkarl has established itself as an major figure within the international jazz scene. Thanks to its unusual approach, the group’s work has also found its way into the textbooks and lectures on jazz history and modern interpretation at the universities in Weimar, Leipzig, Bern and Graz. For the band’s jubilee in 2017, Rudi Mahall, Lömsch Lehmann, Frank Wingold, Dirk- Peter Kölsch and Sebastian Gramss brought their skill and experience to a new dimension. Original historic solos are the new themes! TA selection of unique jazz solo improvisations from the history of jazz since the 40’s are transformed by Underkarl into new compositions. The unique, irreproducible moments of the original spontaneous solos, whether by Miles Davis, T. Monk or Stan Getz, serve on ‘Timetunnel 25’ as the basis for completely new textures and sound colors. For example, Underkarl takes the transcription of the incredible sax solo by John Handy in ‘Goodbye pork pie hat’ out of its original composition (Charles Mingus, album ‘Ah Um’, 1959) and develops a whole new piece around it, moving the focus to the artistry and brilliance of the improviser as an instant composer. In this way, Underkarl transports the energy of the historical moment into the present and brings it back to life. The improvisations of the great masters become the core of novel musical events and inspire these five musicians to outstanding, fresh and vital interpretation. The foundation of ‘Timetunnel 25’ are solo transcriptions of Thelonius Monk, Chet Baker, Stan Getz, Charlie Parker, Miles Davis, Ornette Coleman, Charles Mingus, Steve Lacy, Clifford Brown, Sonny Stitt, Jimmy Hamilton, John Handy and Coleman Hawkins.